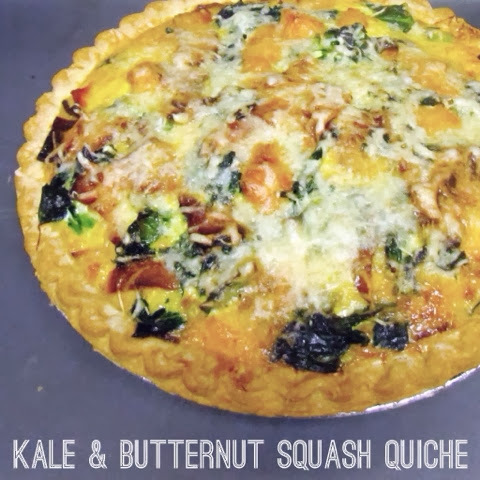 I love, love, love butternut squash, and I can eat an absurd amount of baked kale, so when I stumbled upon a recipe for a kale and butternut squash quiche, I knew I had to make it! 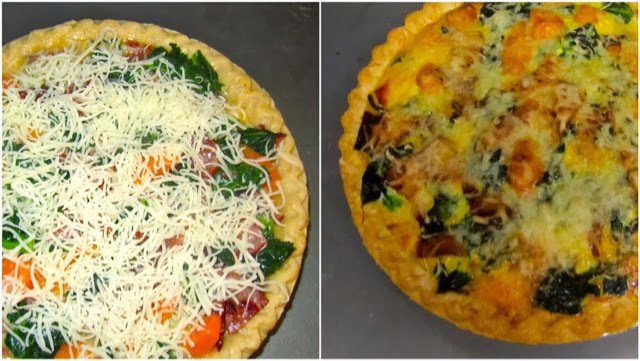 Quiche a great breakfast for John because the left overs can be reheated the next morning for a no-fuss, yummy breakfast. I'm not huge on breakfast foods, but this is a convenient treat to bring to work and heat up when I finally get hungry. 1. Start by cooking your bacon, kale, and butternut squash however you please (I fried the bacon, sautéed the kale, and steamed the butternut squash). 2. Next, beat the six eggs and mix in about 1/4 cup of Parmesan cheese. 4. Top with the remaining Parmesan cheese. 5. Bake for 45 minutes at 375 degrees, or until done. ummmm delicious looking, and sounding. definitely going to try!